The Visa logo is one of the most instantly recognizable symbols on the planet, Visa’s global network completing over 62 billion transactions with a volume of over $4 trillion in 2009. Visa as a company do not issue their own cards, instead facilitating financial institutions with Visa branded products, allowing these institutions to set their own rates and card options. Visa will be listed as a deposit option at a great number of casinos, and is the deposit choice of many. To find out if Visa deposits are an option at a particular site you’ll normally find the payment options on the main page, or failing that on the cashier/banking page (if still unsure contact the customer support team).If you do see the Visa symbol, it’s possible that you’ll be able to use a variety of Visa products, including debit cards, credit cards or even pre-paid cards (check the site for details if in any doubt). If using a casino for the first time, you’ll have to register before you’ll be able to add funds to the site. Depositing is very straightforward. You’ll be asked to input the card number (the long number across the front of the card), the expiry date and possibly the CVV number (the 3-digit number on the back of the card). Finally you’ll be asked the amount you’d like to deposit. The funds will appear in your account immediately. Some users in the US may experience problems when depositing using Visa. In 2006, the UIGEA legislation was passed, making payments from financial institutions to gambling sites tricky and this has led to occasions where payments have been declined. Fortunately, sites which accept US players have great experience in this area and will only be too happy to help you through the deposit process. Some sites have multiple processors, so trying your card at a different one will be the first option. Failing this, the sites might suggest you use your Visa card to load up an e-wallet account and then deposit to the site from the e-wallet. They may also suggest using a money transfer service (Western Union as an example). As the deposit process can be tricky, and is so important to casinos, you’ll find many sites have a dedicated team to assist with this process. If using a pre-paid Visa card or a gift card from the US, it would be advisable to ensure they are available for international use, as a site will be more likely to be able to process this payment. In some countries you’ll be able to make a withdrawal back to your Visa debit card having made a previous deposit. If using a credit card, you’ll not be able to withdraw back to the card, so you’ll find an alternative withdrawal method. 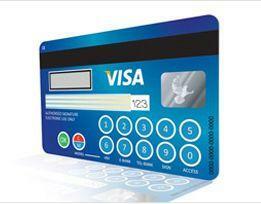 Whether you’ll be charged a fee when depositing or withdrawing using Visa is very much site dependent. Many sites across the world will not have fees associated with using Visa, however some will charge but might waive the fee if you deposit over a certain amount. Check the terms and conditions at particular sites. The biggest advantage is the sheer availability of casinos that accept Visa as a payment option. The vast majority of sites display the symbol, and of course, many users will also be able to deposit with this payment type. The other big advantage is the speed of the transaction. There’ll be no waiting around for funds to clear and you’ll be hitting the slots, the roulette table or playing Blackjack within moments. You’ll be able to deposit using Visa at the Bovada casino. When it comes to gambling you’ll not find many names bigger than Bovada, or their previous incarnation of Bodog. This site offers a great welcome package for new users, with a series of bonuses on your first eight deposits which can amount up to $3,000. The casino at the site features all of your casino favourites, including a great range of slots, roulette, blackjack and baccarat. You’ll also be able to make use of the sportsbook, the poker site and the racebook – all using one wallet.